In the present decade, "co-dependency" has sprung up on the landscape of American popular culture. Portrayed as an addiction-like disease responsible for a wide range of personal and social problems, co-dependency spawned a veritable social movement nationwide. 'A Disease of One's Own' examines the phenomenon of co-dependency from a sociological perspective, viewing it not as something a person "has," but as something a person believes; not as a psychological disease, but as a belief system that offers its adherents a particular way of talking about the self and social relationships. The central question addressed by the book is: Why did co-dependency--one among a plethora of already-existing discourses on self-help--meet with such widespread public appeal? Grounded in theories of cultural and social change, John Steadman Rice argues that this question can only be adequately addressed by examining the social, cultural, and historical context in which co-dependency was created and found a receptive public; the content of the ideas it espoused; and the practical uses to which co-dependency's adherents could apply those ideas in their everyday lives. In terms of the larger American context, his analysis links the emergence of co-dependency with the permeation of psychological concepts and explanations throughout Western culture over the past thirty years, focusing particularly on the cultural and social impact of the popular acceptance of what the author calls "liberation psychotherapy." Liberation psychotherapy portrays the relationship between self and society as one of intrinsic antagonism, and argues that psychological health is inversely related to the self's accommodation to social expectations. 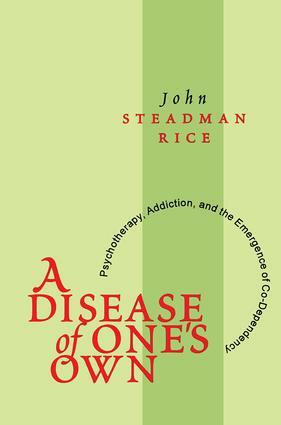 Rice argues that a principal source of co-dependency's appeal is that it affirms core premises of liberation psychotherapy, thereby espousing an increasingly conventional and familiar wisdom. It simultaneously fuses those premises with addiction-related discourse, providing people with a means of making sense of the problems of relationship and identity that have accompanied what Rice terms the "psychologization" of American life. This brilliant analysis of the phenomenon of co-dependency will be of interest to psychologists, sociologists, psychotherapists, and those interested in American popular culture.